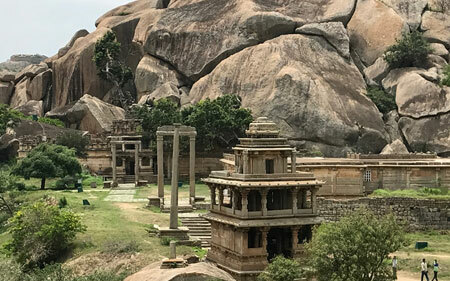 Chitradurga is the fortress town located in the southern part of Karnataka. Apart from the fort, the town is popular for the amazing spread of huge boulders and interesting rock formations. There are many rock temples in the area that make it an even more interesting tourist place worth visiting. The road leading to the town has the beautiful site of Vanivilas Sagar Dam on the way. Spend some time observing the rows of windmills that instantly capture one’s attention. Chitradurga is often revered as a picturesque fort with eye-pleasing and majestic beauty surrounding it. The name of the fort translates to the ‘fort with rock art forms’. The fort was cleverly designed to the entry of foreign elements. It is believed that there are four secret entry points to the fort that remain invisible to the visitors. There are multiple watch towers in the fort complex that should have helped the occupants to keep an eye on the enemy. The fort has nearly 20 gateways, though it is difficult to believe the number considering the invincible construction of the fort. Chitradurga has its mention in the most popular Indian epics named Ramayana and Mahabharata. In fact, the boulders spread all over are believed to have resulted from the fight between Bhima, one of the five Pandavas in Mahabharata, and a demon named Hidimba. The town was later established on these boulders and is considered as the oldest Indian rock formation. Chitradurga Fort was constructed by the rulers of the Nayak Dynasty. The rulers later lost the fort to Hyder Ali in the 19th century. The interesting features of the fort include Yenne Kola and Tuppada Kola, the pits that were dug to store oil and ghee for various purposes. Meludurga Siddhi Vinayaka Temple with the statue carved in the shape of an elephant back is another worthwhile attraction within the fort. The exciting rock art form is apparent from the way the huge boulders lie shaped up into figures of animals like elephant and rabbit. There are nearly 18 ancient temples in the fort, the most popular being the Hidimbeshwara Temple. Granaries, water tanks and a mud fort to absorb the excess of heat are other highlights of the complex. Chitradurga is also surrounded by other attractions like Chandravalli Caves and Ankali Matt that accommodates a huge Shiva Lingam. Trekking is possible on the rocky hills at this place. Adumalleshwara temple, known for a zoo and a waterfall, can also be visited.